While teaching English in South Korea, Lesley Triplett grew to love the food sold by the local street vendors, especially their dumplings. Before she returned stateside, Lesley learned some of the basic tricks to dumpling making from a woman who operated her neighborhood dumpling stand. 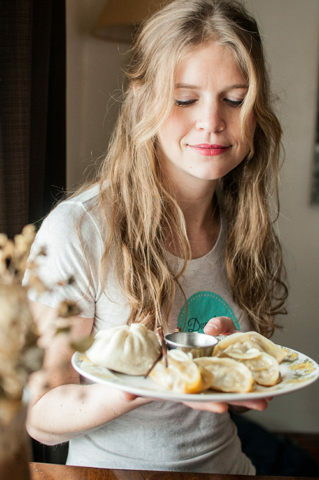 Upon returning to the United States, Lesley found she missed the food of South Korea and she started making the dumpling recipes for her friends and family. She was encouraged to set up a stand at her local farmers’ market, where she developed her dumpling creations into a small business. Dumpling Darling, which opened in February 2015, sells Asian-style dumplings with a Midwestern twist, created using locally-sourced ingredients. Lesley’s business progressed from selling dumplings at several farmers’ markets, to a part-time retail location in the NewBo Market in Cedar Rapids, to a shared location with another restaurant, and finally to a second brick and mortar location in Iowa City. Lesley initially worked on her business part-time but eventually was able to quit her teaching job and work full time on her dumpling business. Before she presented her business plan to the Board of Directors of NewBo City Market in Cedar Rapids, Lesley approached Kirkwood SBDC Regional Director Scott Swenson for assistance in reviewing her business plan. After some fine tuning by Scott, Lesley was able to secure financing to open a location in the public market place. Scott then helped her obtain funding for the build-out of her restaurant space through the East Iowa Council of Governments. Additionally, the SBDC encouraged Lesley to apply for the “Invest in She” pitch competition for female entrepreneurs. After Scott coached her on her pitch, Lesley went on to win $12,000 for her business. Scott also helped Lesley expand her restaurant to a second retail location by assisting Lesley in putting together a financial presentation for potential investors. “Working with Scott at the SBDC has been incredibly helpful and I wouldn’t be where I am today without him,” she says. Lesley saw her sales grow by over sixty percent from 2015 to 2016 and she currently markets her business through social media. The business now employs 14 people, including herself and her husband. Along with her brick and mortar stores, Lesley’s product can be found in local grocery stores in Iowa City, Coralville, Cedar Rapids, and Clarion. Additionally, Dumpling Darling does special event catering and continues to sell dumplings at the Iowa City Farmers’ Market. With her husband, who traveled to South Korea with her, joining the company’s staff full-time Lesley considers Dumpling Darling a family business, and hopes it will stay that way for many years to come. For more information on the unique dumpling creations offered by Dumpling Darling, visit http://www.dumplingdarling.com/ or https://www.facebook.com/ICDumplingDarling/.